The Ordinary Life of an Extraordinary Girl: Happy Thanksgiving 2010! I wrote this one year ago and it is even truer today than it was a year ago. My thanks to everyone who has been reading about Alex for the last year! Millions of families in the United States will sit down tonight to share a meal of thanks. At this celebration of Thanksgiving, appreciation and gratitude for many blessings will be shared. Many tables will toast good health and good family. Others will share thanks for new family members, found jobs, or better opportunities. Hundreds of appreciations and recognitions will be exchanged on this very special day. Our table will be no exception. This celebration of thankfulness is a very important part of my family tradition. I think about this special evening for days. I want to be able to express my feelings in a thoughtful and meaningful way to my loved ones. In some ways writing is a bit easier to me. Over the last 17 years, I often got stuck on the same question. Am I thankful for down syndrome? I know our lives would be different if we were not touched by down syndrome. But, am I truly thankful we have had this experience in our lives? I have pondered, over pondered and obsessively pondered, but this year I believe I have found my answer. Yes, I am thankful for down syndrome, specifically for the joy it has brought to our lives. I know I am not thankful for children born with such serious heart issues they require surgery after birth. I hate the gastro intestinal issues and other health problems that affect many young children. I am anxious for all the children whose hearing, eyesight and muscle tone is compromised by that darn extra chromosome. All these problems affect cognitive development - and that is just not fair. I detest the discrimination that many individuals with down syndrome experience in their lives. I can’t stand that so many adults with down syndrome do not have the support mechanism in place to life semi-independently, hold fulfilling jobs or marry. I am mad when individuals with down syndrome can not realize their dreams. When Alex becomes frustrated because I can’t understand her, I get frustrated too. I am angry she gains weight much quicker than my other children, or that she can not recognize when she is full. I wish Alex could read at her grade level, or take algebra or geometry class. 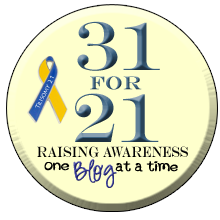 I am not thankful for many of the troubles associated with down syndrome. But, I know, down syndrome has improved our lives in so many ways. This is where I have difficulty expressing my feelings in a thoughtful and meaningful way. Writing, with its ability to edit, delete and monitor is easier. So, I attempt. I am incredibly thankful for Alex. I am indebted for what she has brought to our lives. I am grateful for the change that occurred in our hearts and souls the moment Alex was born. I am happy for the kindness and consideration my other children show to their peers. I believe we are all better people because we have Alex in our lives. I love her sweet personality, beautiful smile and sense of humor. I admire Alex's joy in the world around her, her ability to filter the bad and focus on the good, her love of music and art. I applaud Alex’s desire to succeed and her absolute insistence on being a “normal” teenager. I appreciate her dreams of her future, ones that we will help her to realize. This lesson of life could not be learned without Alex as our role model. We are fortunate for friends and family who rallied around us when Alex was born. Also, the medical community who knew how to monitor and treat Alex when she was born, and the educational community who knew how to educate and intervene with services from birth. Today's professionals are knowledgeable and dedicated. I know we are lucky Alex was born in the 90's and not the earlier decades. I am thankful for all the passionate and caring people we have met because we have Alex in our lives. To date, we have been involved with NADS, Challenge Aspen, WindWalkers and the Special Olympics. I know this list will increase. 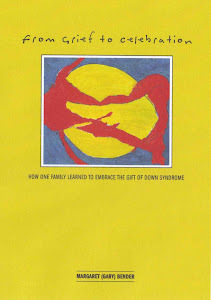 We would never have known about this world of not for profits if we did not have down syndrome in our lives. I can not imagine the void we would have in our lives if we had not learned about helping others. Yes, I am thankful for all the wonders associated with down syndrome. Actually, I am more than thankful, I am humbled. Humbled we have this opportunity to be better people. Overjoyed, we have Alex in our lives. I am thankful for what down syndrome has brought to our lives. Humbled is a really good way to put it. I know exactly what you mean by that and by much of the rest.